As boomers continue to retire at an increasing rate – many with underfunded retirement savings – we believe sponsors can make design changes now to positively impact future retirees. 2018 marks the seventh consecutive year Xponential Growth Solutions (XGS) has held the Retirement Plan Roadshow, first founded in 2012 to assist U.S. employers in reaching their retirement plan goals through educational workshops. 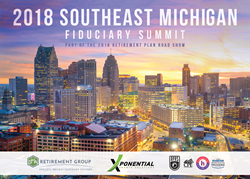 The 2018 Southeast Michigan Fiduciary Summit, set to take place Wednesday, May 9th, 2018 from 8:00am to 11:50pm (seminar & breakfast), with a special session for Defined Benefit plan sponsors from 11:50 pm - 12:30 pm at Walsh College, in Troy, Michigan. XGS is committed to providing education and resources that help business owners, fiduciaries, and finance, human resource, and benefit executives to better understand retirement plan best practices and industry trends. This, in turn, allows them to make informed decisions and develop strategies that will help businesses to grow and provide positive outcomes for plan participants. The annual Retirement Plan Road Show supports this goal by pairing local speakers with industry leaders to discuss a diverse range of topics, from fiduciary responsibility, plan design, and investments, to healthcare, wellness, and more. In 2017, the Retirement Plan Roadshow reached over 1,200 companies and organizations, positively impacting more than 2 million plan participants representing over $125 billion in retirement plan assets. XGS hopes to have an even greater impact with the 2018 Retirement Plan Road Show. Following last year’s successes, Kelley Snook, the President of SHA Retirement Group (Auburn Hills, MI) and David Anderson, Partner at SHA Retirement Group have once again been tapped to host the Southeast Michigan Fiduciary Summit. Dave emphasizes that "As boomers continue to retire at an increasing rate – many with underfunded retirement savings – we believe sponsors can make design changes now to positively impact future retirees. If done correctly, these changes can enhance the entire benefits structure while potentially improving an organization's future profitability. In addition, and surprisingly, employees are very receptive to these changes." The cost to attend this event is a registration fee of $150, which may be waived for select, qualified plan sponsors following completion of a one-minute Retirement Plan Roadshow survey. Xponential Growth Solutions (XGS) is an independent resource for unbiased education, best practices, and referrals, working to help employers make informed decisions about retirement plans in order to create a positive impact for plan participants. XGS offers solutions for 401(k), 403(b), 457, and defined benefit retirement plans, while also facilitating national fiduciary educational summits designed to help human resource, finance, and business professionals in charge of retirement plans to understand and observe best practices in order to reach retirement plan goals. XGS founded the Retirement Plan Roadshow, a nationwide series of educational summits featuring local and leading fiduciary experts, in 2012. Since 2004, SHA Retirement Group has advised organizations with the goal of positively impacting the futures of employees while helping manage fiduciary risk and overall long term cost. We specialize in 401(k), 403(b), defined benefit, and nonqualified deferred compensation plans. Based in the metro-Detroit and Grand Rapids, Michigan, SHA clients are colleges, universities, and businesses in the manufacturing, automotive, and service industries. SHA Retirement Group leverages extensive resources to connect retirement plan objectives with a program that is successful, measurable and helps ensure participants' long-term retirement success. Investment Advice offered through Resources Investment Advisors, Inc., an SEC-registered investment advisor.